Am I ever glad I braved the Post Office From the Black Lagoon and got all those letters mailed! Because suddenly my life has become very exciting. Well, I mean, my life is always exciting. But now it is more exciting. Because whenever my phone rings I never know who it will be! Those letters I mailed, remember, were to people who knew Leonard Pennario, people who for some reason or other I had not gotten around to talking with yet. I am trying to get this book into shape. Anyway, yesterday my phone rang and it was Kaye Ballard, the cabaret artist and movie actress. She could not have been more gracious and she is going to talk to me next week. 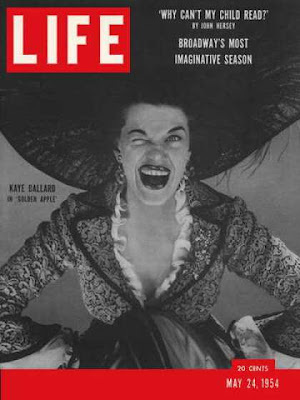 Here is a classic picture of the great comedienne Kaye Ballard. I was "Miss Ballard"-ing her and she told me to call her Kaye. "I'm calling you Mary," she said. It is so nice of her to get in touch with me so fast. Pennario's friends really loved him. Good thing I have such nice matters to dwell on because lastnight, I do not know what it was, I could not sleep. And I had gone to my killer Pilates class and everything! I think it was that I was just warm. We have this electric fan in the window but sometimes the air just grows torpid. Torpid. That is a great word! I just looked it up and it comes from the Latin "torpidus," from the verb "torpere," which means to be sluggish or schuft-ish. Look, now I know another Latin word. Congratulamini mihi! So I could not sleep in the sultry night and I rose at dawn which, this being two days after the longest day of the year, occurs at about what, 2 a.m.? It could be the excitement of lastnight. The conversation with my new friend Kaye, and then my friend Gary showed up out of the blue and picked me up in his Spider convertible and took me downtown. What about the spider I saw the other day? Spider Martin was the first jazzman I ever interviewed. We conducted the interview on the sidewalk in front of the Ontario House in Niagara Falls on a torpid and sultry night. 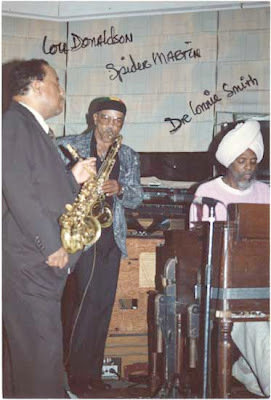 Look at his hip trio, with Dr. Lonnie Smith! This is not the first appearance Dr. Lonnie Smith has made on this Web log. Back to last night. Gary and I took the Spider down Grant Street which was sultry and torpid in the evening heat. He said he was hoping to impress hot Latina Grant Street girls. Gary has been working construction at Lorigo's Meating Place and he says that now that he is a construction worker he can ogle girls openly. That is the phrase he used! I am still laughing about it. He added: "We're up there on those beams, we're yelling all kinds of filth!" Ha, ha! Well, I know Gary and I know he would never yell filth. Gary and I sat on the patio of Shanghai Red's and drank margaritas and were soon joined by Howard who ate a fish fry. That is a beautiful picture of Shanghai Red's up above. After that we stopped by the free all-night concert in Niagara Square. Gary said a pianist was playing there, named Leonard something-or-other. It was not Pennario! That is all I know. But zut alors! As soon as we turned up Leonard whoever he was ended his set. Plus there was nobody there anyway! There were about two other people at this all-night concert besides us and both of them were friends of mine who up until now had existed only on Facebook. Their names are Toni Taber and Diane Strawbrich. They came up separately and introduced themselves. It was like magic, Facebook coming to life! Last night lying awake I kept thinking of this all-night concert, going on and on, into the night, all through the night, with nobody there. It is still going on now! I think it goes until late this afternoon. Perhaps I will walk over on my lunch hour and see how it is going. 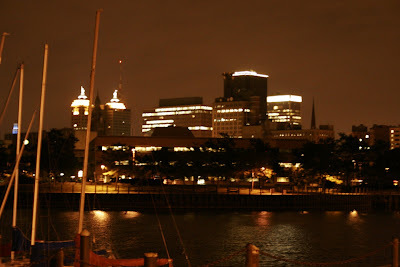 Note to out-of-towners: In Buffalo there is so much going on that you can have an all-night free concert in the middle of the city and nobody has time to show up. We are the city that never sleeps! In Latin, is a schuft a "torp"? Must be interesting to be famous...my Facebook page is torpid. And what a strange concert you describe. Perhaps we need to dig up the 'Grateful Dead' or something? Surely they would draw an audience even if it were just haints. That is exciting news about the book!!! Tell Kaye she was great in "The Mothers-in-Law" with Eve Arden. That'll impress her. Budd, thanks for the tip on what to tell Kaye! When I talk to her I will have to report on the experience. About "torpid," I am realizing that the funny thing is, Pennario used it in his diary and that is what put it in my head. There was this sentence I had copied out and it was sitting in front of my keyboard. Hahahaha! I will have to write about that..